A Toronto woman has become the city's first residential landlord to be jailed for neglecting to maintain smoke detectors, after her tenant died in a fire. Cuc Chau was sentenced to 15 days in jail to be served on weekends, fined $2,000 and placed on probation for 18 months following her guilty plea to four Ontario Fire Code offences. Chau had initially pleaded not guilty to the charges, which were laid after the provincial fire marshal's office investigated a blaze at a two-storey home at 225 Atlas Ave., in the Oakwood Ave. and Vaughan Rd. area, on Jan. 29, 2001. The two-storey building, which neighbours say is divided into three apartments, has been renovated since the fire. During the trial, investigators from the Ontario fire marshal's office testified that tests conducted on a smoke detector recovered from the debris indicated that it contained no batteries, and that David Tran's life could have been saved had the smoke detector worked. People convicted of smoke-detector related offences can be fined up to $10,000 and jailed up to one year for each infraction. Ontario fire marshal Bernard Moyle said that to his knowledge, "this will be the first time in Ontario that an individual will serve time in jail for failing to provide or maintain working smoke alarms. "As indicated by the penalties in this case, the fire service and the courts are taking the matter of smoke alarms seriously," Moyle added. "Missing or inoperative alarms will not be tolerated." He stressed that homeowners who fail to install and maintain the smoke detectors required by law could also face jail, as the requirements apply to every home in Ontario. "Smoke alarms are critical to provide early warning if a fire occurs in a home. ... They are required by law to be provided to all tenants and maintained in good working condition. "Deputy Chief Terry Boyko of the Toronto fire department also welcomed the decision, delivered Monday by justice of the peace Marcel Bedard at the Keele St. provincial courthouse. "This case sends the message that as homeowners and landlords that rent properties to others, we have a responsibility to protect those that live in our houses, whether we own the house or rent it to others," Boyko said. "These detectors cost so little and are so easy to operate and maintain. "It troubles me that we have to pursue these cases in the courts. "Boyko says smoke detectors are crucial because most fatal home fires occur at night when people are asleep, "and often victims don't wake up. "When fire breaks out, the smoke alarm, functioning as an early alarm system, provides precious time to escape and can significantly reduce your chances of dying in a fire. "The department advises people to install smoke detectors on every level of the home, and inside and outside each sleeping area, and to replace weak or dead batteries immediately. Toronto Fire Chief Alan Speed vowed to seek tougher penalties against building owners who fail to maintain smoke detectors after a dark week in December, 1999, when seven people died in Ontario in three separate fires. Smoke-detector related charges were laid in two cases. The decision may be a first in Canada. Deputy Chief Ron Ritchie, who is in charge of fire prevention for the Vancouver fire and rescue service, says that in 31 years on the job, he has never heard of anyone in Canada being jailed in a similar situation. Ritchie, who says combining smoke detectors and sprinklers has drastically reduced fire-related deaths in his area, plans to contact Toronto prosecutors about the decision. "I am quite surprised (by the jail term)," he said, noting he would like to see similar sentences in Vancouver. John Conley of the Calgary fire department says judges may be reluctant to jail landlords and homeowners in such cases, "because they see this as the terrible result of an accidental situation." But he says judges need to realize that their decisions can help save lives by reminding landlords "that their mandate is to ensure that the units they rent out are fire-safe." A member of a local tenants' organization was pleased to hear Chau got a tough sentence, but expressed concern that action wasn't taken until someone died. "Fifteen days isn't going to do anything for the (dead) tenant," said Dan McIntyre, a program coordinator for the Federation of Metro Tenants Association. "But maybe it will give the message to landlords that they're responsible for their property. 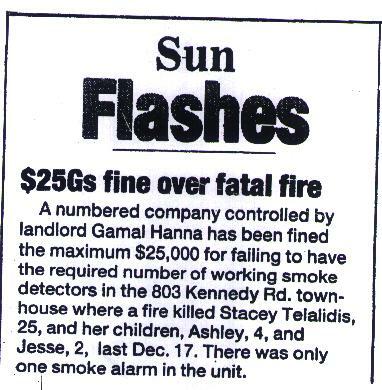 "Hopefully landlords will read this story and check all their smoke detectors. "Patricia Miller, communications director for the Fair Rental Policy Organization, a province-wide group that educates landlords and tenants about their responsibilities, said the court's decision was right. "It sounds like justice has been served," Miller said. A Toronto landlord has been handed a stiff jail sentence for the second time in two years after failing to bring a rented house in the west end up to fire code standards. Avtar Singh Dhuga was sentenced to 45 days in jail and handed $4,000 in fines on Thursday. His wife, Bakhshish Kaur Dhuga, who is also an owner of the property on Old Weston Rd., was sentenced to 10 days in jail and given another $4,000 fine. "It's unprecedented," said Captain Derek Collins, of Toronto Fire Services' legal section. "We've never had anything comparable as far as the 45-day jail term in the last 20 years." Collins said the jail time was so steep because the couple had been charged with the same fire code violations about two years ago but had failed to rectify the problems. "The previous conviction definitely played a part in the severity of the sentencing," he said. In 1999, the Dhugas were charged with six violations of the Ontario Fire Code, including failure to install an interconnected smoke alarm system and lack of fire separations within the building. The house also had an inadequate number of exits and lacked proper fire doors. In February, 2000, Avtar Singh Dhuga was sentenced to 14 days in jail and given $5,000 in fines, and his wife was fined $7,500 for those six violations. When Toronto Fire Services returned to the property three months later for an inspection, the house was still in violation of the six charges. Still, the Dhugas were given another chance after a second trial in May, 2001, when they were told that they had until August to bring the building up to code. But by the trial date last Thursday, there were still three outstanding violations. A tenant, who did not wish to give her name, said that there had been workmen in the building over the past two months. Inside there were three new doors on the ground floor, a new smoke alarm on the ceiling and a new emergency fire alarm near the front door. In the hall corridor, however, two new doors were propped up against the wall, waiting to be installed. Deputy Fire Chief Terry Boyko agreed the jail penalty this time around was severe, but he thinks it was necessary. "This sentencing sends a warning that the penalties will become increasingly severe," he said. "(Landlords) have people's safety in their hands and if they don't comply with the fire codes, then people are subjected to living in unsafe conditions." Reached last night at her home in Thornhill, Bakhshish Kaur Dhuga was weeping when she talked about the the trial on Thursday and about going to jail. She said that they bought the house at 287 Old Weston Rd. just south of St. Clair Ave. W. about 15 years ago. The house has five units that are available for rent. Collins said the couple received different sentences because they had different responsibilities in the building. "Both were aware of the deficiencies," Collins said. Boyko says there have been buildings in the past where the fire-code requirements were not up to standard, with serious consequences and sometimes fatalities. The fire code has been around since 1981 and Collins said there has never been a sentence this substantial. Two landlords have each been fined $10,000 for failing to comply with Ontario Fire Code regulations at an apartment building in Richmond Hill. John and Maria Boso, owners of a four-storey apartment building at 595 Major MacKenzie Dr. E, were convicted in Newmarket provincial court last Thursday for not conforming to new fire code provisions requiring a complete fire alarm system and fire-rated doors. They were originally charged with the offences on Jan. 18 1999. In addition to the fines, the pairs probation order states they have 60 days to bring the building up to Ontario Fire Code safety standards. The case had been before the courts for six months. According to Richmond Hill fire prevention officer Jennifer Lang, normal self-closing doors are inadequate in an apartment building, especially in the entrances to laundry and boiler rooms. The Major MacKenzie building also has holes in the ceilings and corridors. "It was kind of nice to see it finally happen because the courts have been very lenient in the past," explained Capt. Paul Schuster. "These guys got a lesson because they have been snubbing their noses at us and not doing the work. "The judge finally said enough is enough and I'm finally glad to see it." Lang said the lack of proper safety features throughout the building is a recipe for disaster, especially since three separate fires were set in the building on Dec.21. "There was a garbage can on fire and a Christmas Wreath on somebody's door was lit. It could have been a very, very bad situation," she said. "Luckily somebody saw it because there is no fire alarm system in the building. "It's a run down building to begin with and on top of that it's not even safe. With a $20,000 fine, hopefully this will make our job easier. These are things that are required to make a building safe. When others have been ordered to do it after apartment building checks, they have done it."